Ms. Xiaochen Zhong (European Studies - French Stream, Year 4) (third from right on front row) represented our programme at the 10th Pearl River Delta Inter-University French Speech Competition which was held at the Shenzhen University. 'Bravo' for her remarkable performance! Ms. Lai Hiu Kwan Winona (European Studies - French Stream, Year 4) captured the first prize at the ninth Pearl River Delta Inter-University French Speech Competition. She was awarded an all-expenses-paid, one-month course at Lyon in France where she will study French language and culture this summer. Winona also won the dictation competition and will represent Hong Kong in the finals which will be held in Beijing. 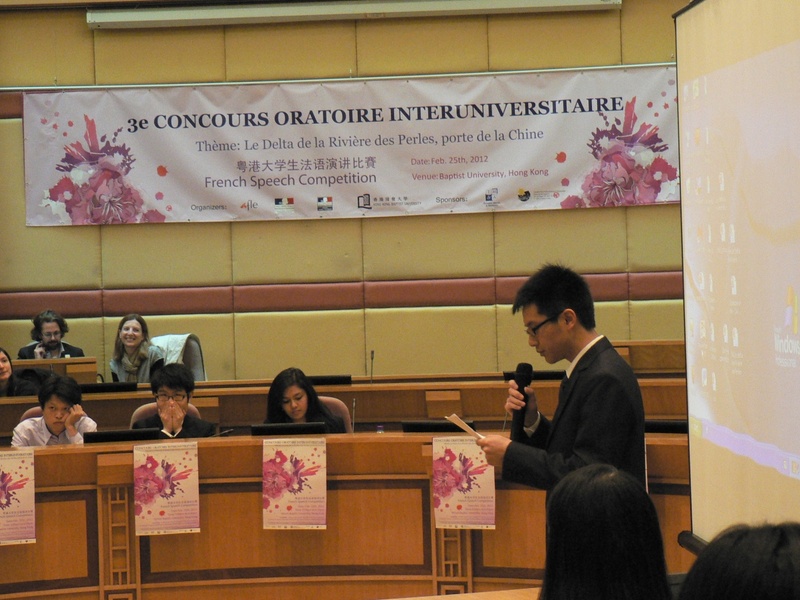 The speech competition was jointly organised by HKBU and Consulate General of France. 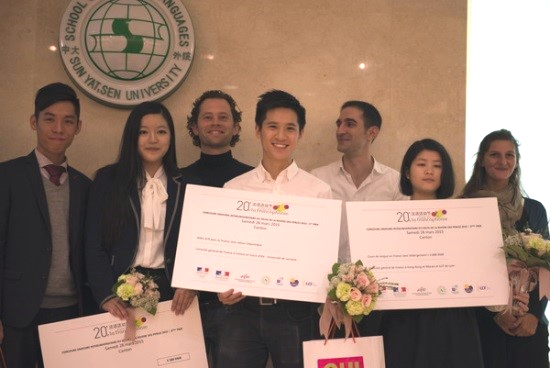 Ms. Lai Hiu Kwan Winona (fourth from left) captured the first prize at the ninth Pearl River Delta Inter-University French Speech Competition. 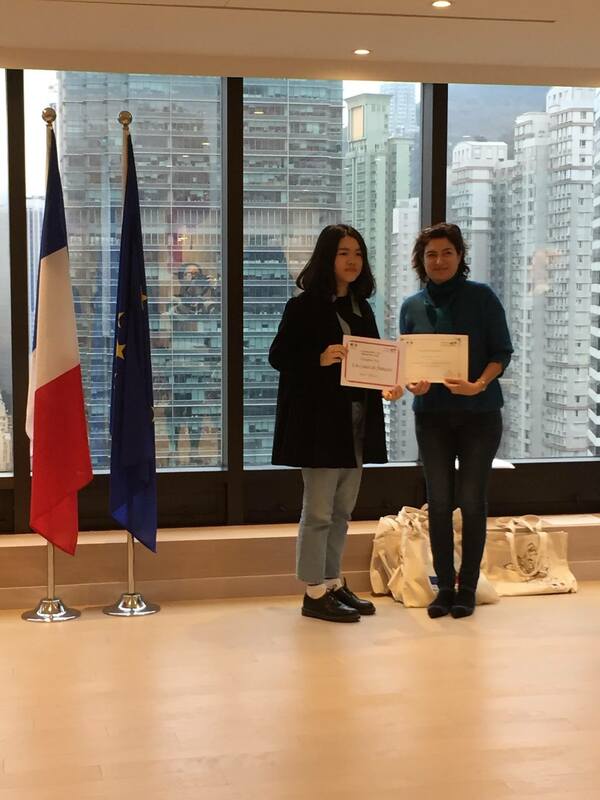 European Studies French Stream Students won 1st and 3rd prizes in the round of selection of 2018 French dictation competition "La Dict?e de Pivot"
Congratulations to our Year IV European Studies (French Stream) student, Ms. Lai Hiu Kwan Winona won 1st prize at the French prestigious dictation competition "Dict?e de Bernard Pivot", and presented Hong Kong at the China finale in Beijing on 21 March 2018. 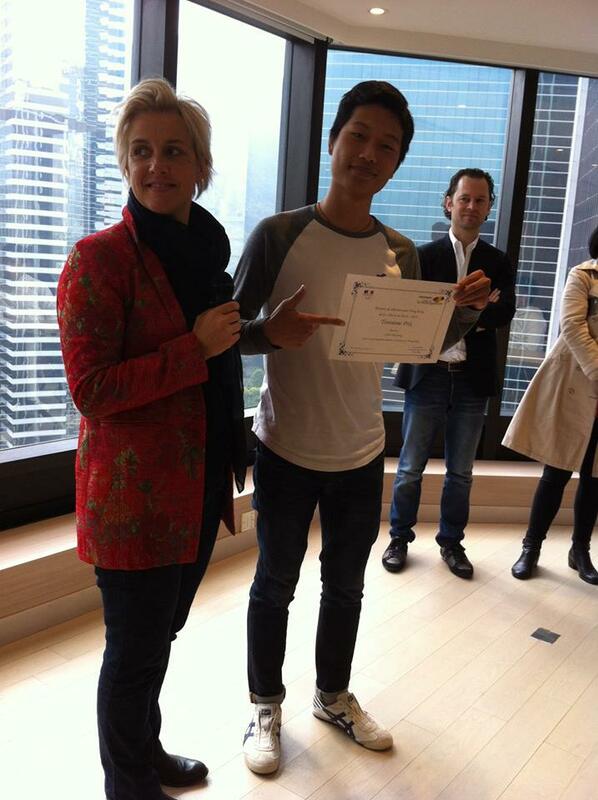 A great congratulations also to our student - Mr. Lam Chak Wing Anson - who won the 3th prize during this selection of Hong Kong candidates who took place on 10 February 2018 at the Consulate General of France in Hong Kong. Ms. Lai Hiu Kwan Winona won 1st prize at the French prestigious dictation competition "Dict?e de Bernard Pivot", and presented Hong Kong at the China finale in Beijing on 21 March 2018. 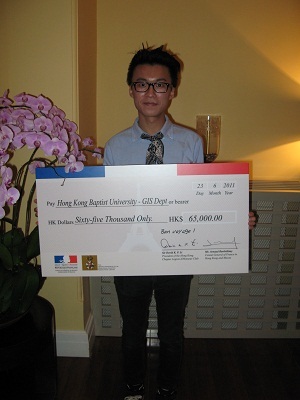 Mr. Lam Chak Wing Anson - who won the 3th prize at the French prestigious dictation competition "Dict?e de Bernard Pivot". To celebrate the international day of Francophonie (March 20) and the promotion of French language and cultural diversity in the world, Francophonie Festival spreads throughout the month of March in numerous countries with a wide range of events. Ms. IP Wing Yan (Rosen): 2nd prize at the dictation competition - La Dictée de Bernard Pivot 2017. Ms. KWOK Hoi Yan (Charlene): tied for 3rd prize at the dictation competition - La Dictée de Bernard Pivot 2017. 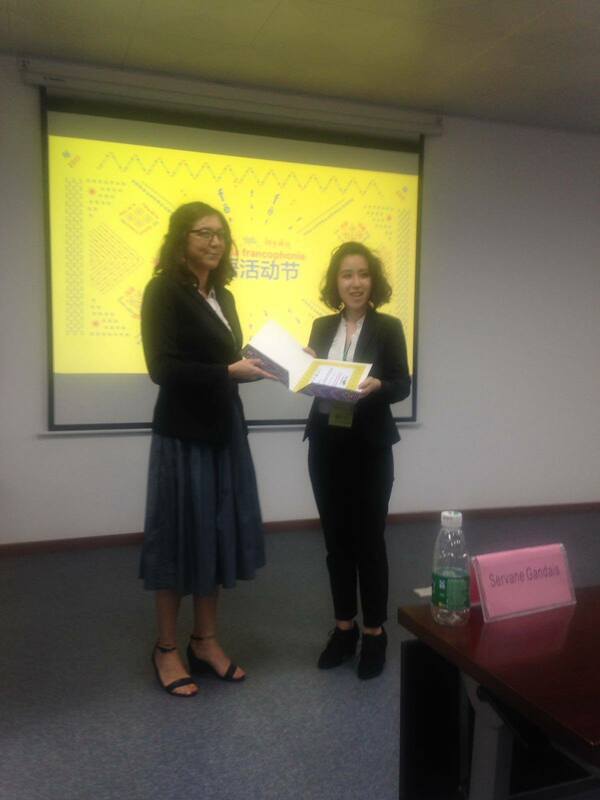 Ms. TONG Athena Kerin: 2nd prize at the 8th Pearl River Delta Inter-University Speech Contest, with a presentation titled "Urban Innovations: For a Greener Delta". 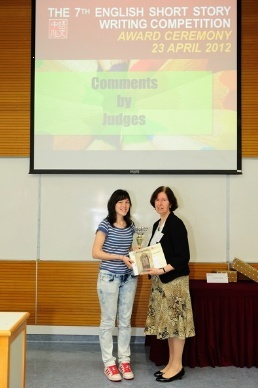 Tong Athena Kerin receiving the 2nd prize at the 8th Pearl Rover Delta Inter-University Speech Contest. IP Wing Yan receiving her 2nd prize at the dictation competition — La Dictée de Bernard Pivot 2017. 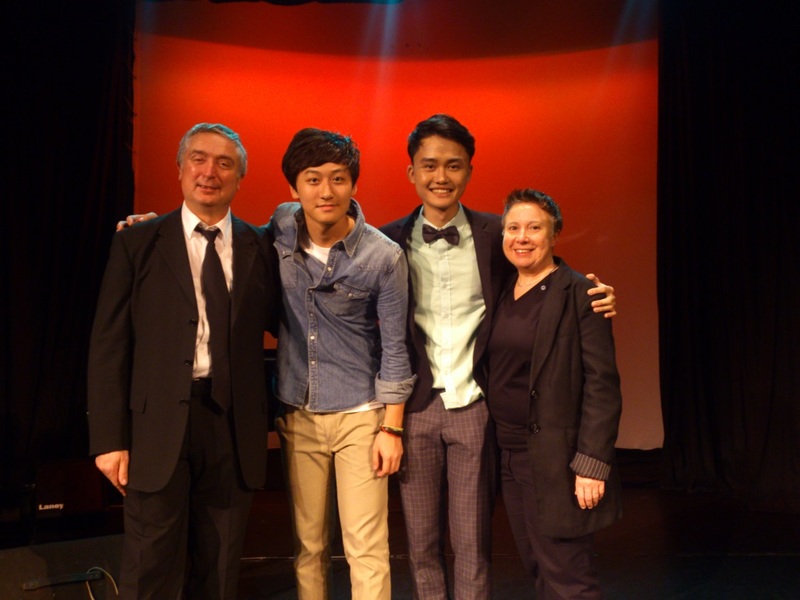 KWOK Hoi Yan (middle): tied for 3rd prize at the dictation competition — La Dictée de Bernard Pivot 2017. The 6 European Studies French Stream Students who participated in the dictation competition — La Dictée de Bernard Pivot 2017. From left to right: IP Wing Yan, KWOK Hoi Yan, CHAU Cherry, LI Pui Ying, LEE Kitson, LAI Cheuk Ying, and Ms. Céline Dias, French language lecturer. As I Open My Eyes [À peine j'ouvre les yeux], director Leyla Bouzid, drama 2015, France-Tunisia. 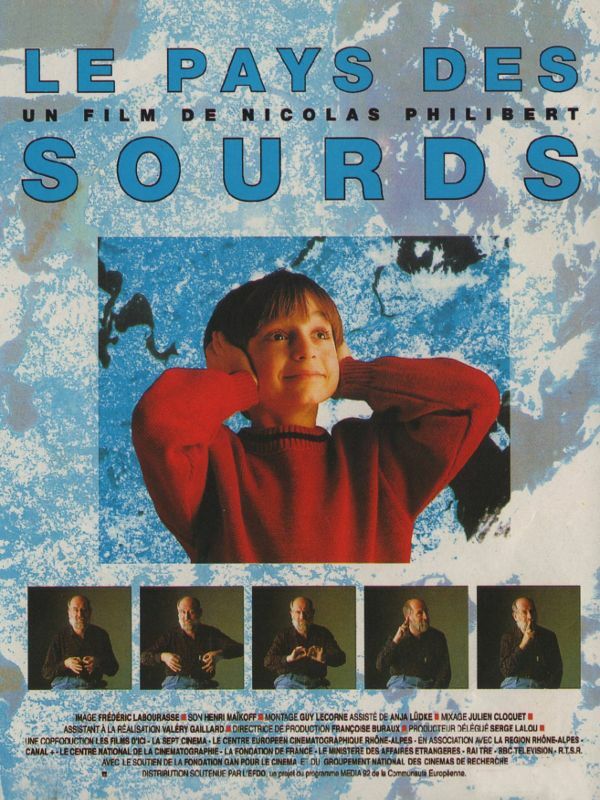 In the Land of the Death [Le Pays des sourds], director Nicolas Philibert, documentary 1992, France. Mr. ZHANG Yueren and Mr ZHOU Yicheng (last row, 2d and 5th left respectively) and the other participants of the competition with Philippe Guinet (last row, 1st left) and the members of the Jury. In May, 14 students from 3 different universities (Baptist University, Community College of City University and Chinese University) joined a 3 days intensive training module with Philippe Guinet, creator of the Association Les Passeurs de Mots whose aim has been to develop workshops and trainings on the orality of the French language for over 15 years. 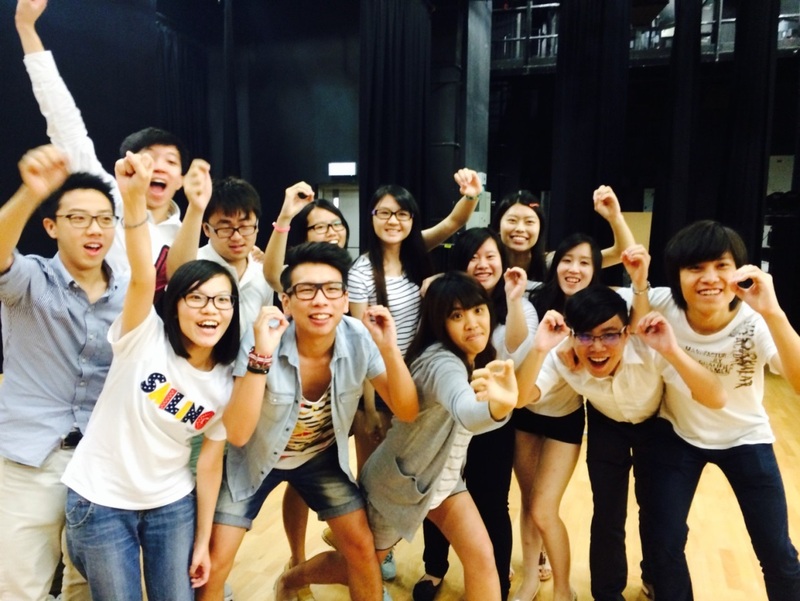 This workshop was followed by a performance and a competition of theatrical expression of the students, which was held at HKBU. 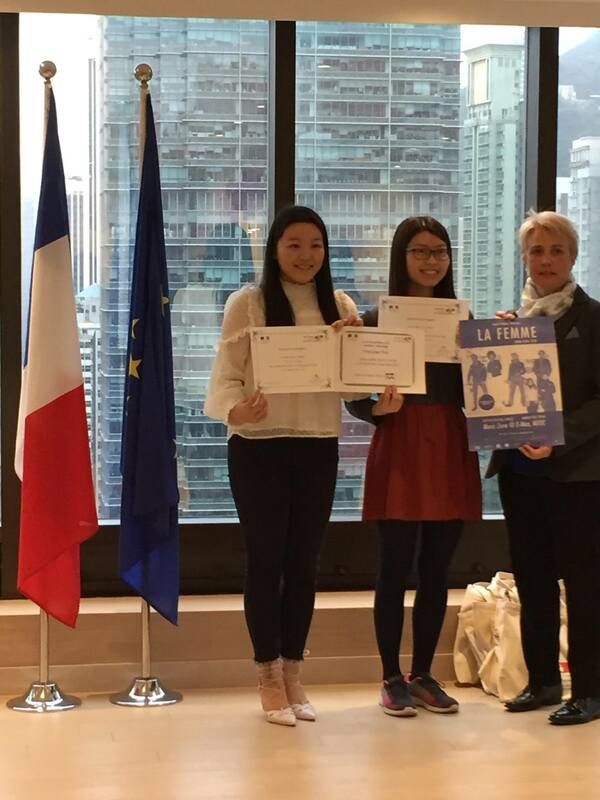 Mrs. Soizick Casteleyn, president of the French Teachers Association of HK (AFLE), officiated the awarding ceremony. 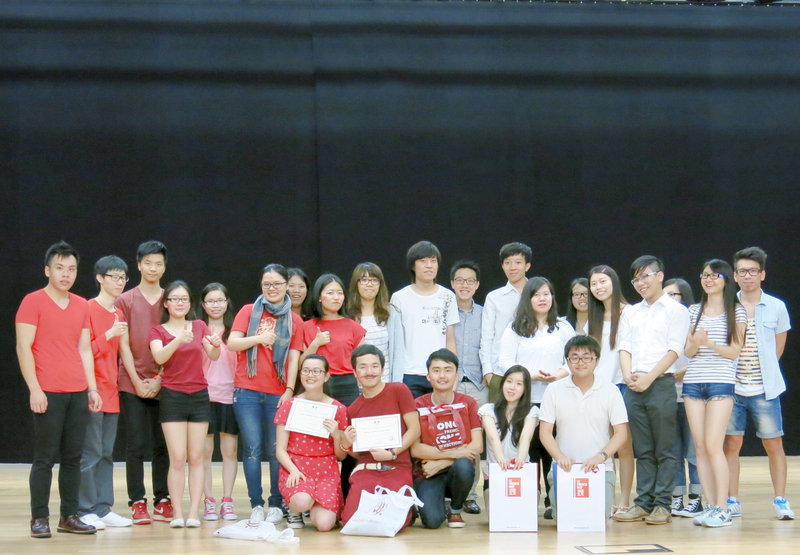 Two European studies students (Year II) were rewarded: Mr. ZHANG Yueren and Mr ZHOU Yicheng received the 1st and the 3rd prize respectively. 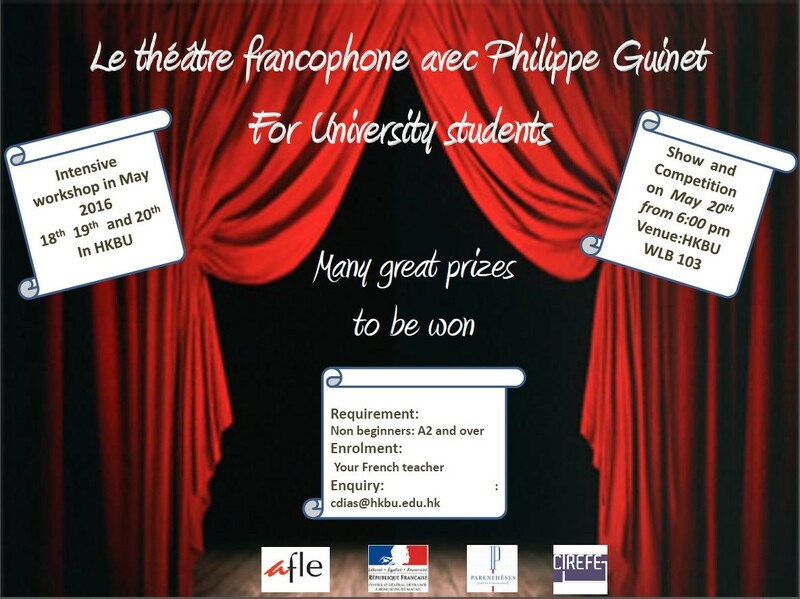 Congratulations to all our TALENTED French learners!!! (2014). She was awarded the prestigious Alexandre Yersin Scholarship to pursue her studies in Digital Marketing at IÉSEG, school of Management in Lille (France). She was selected out of 40 applicants! This scholarship offers a €660 allowance per month for the preparation of a Master degree. 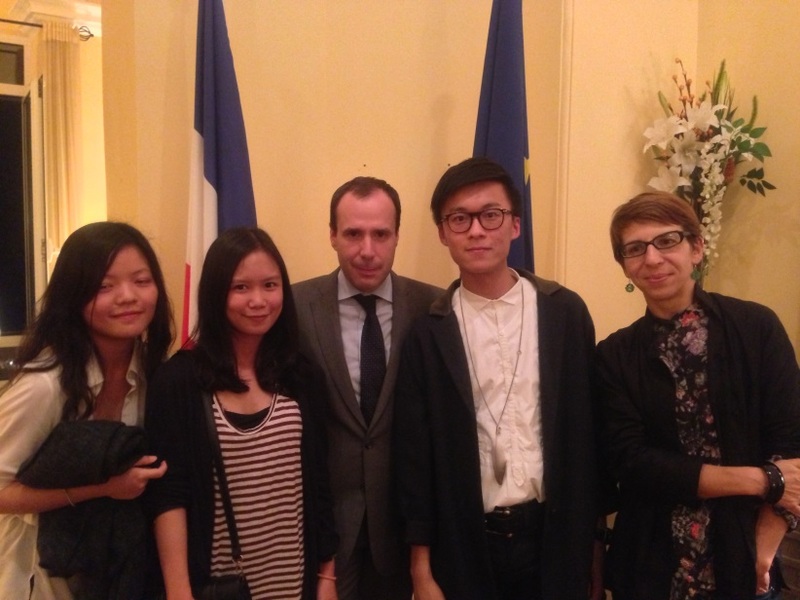 Mr Eric Berti, Consul General of France in Hong Kong and Macau officiated the scholarship awarding ceremony, on the 30th of May 2016 at the “Résidence de France”. 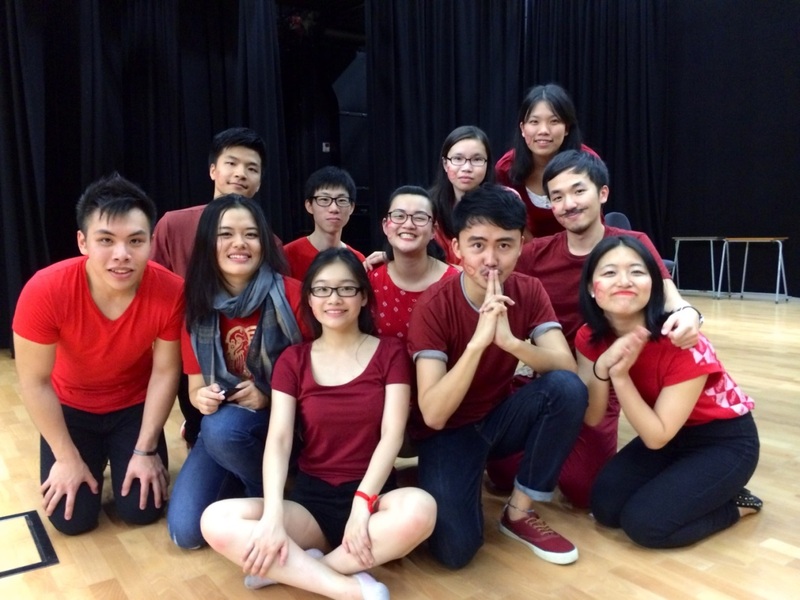 2015 is a brilliant year for our fresh graduate Lai Sze Fat! Not only, he was accepted by the prestigious University College London (UCL) to do a MScUrban Design & City Planning but he also received the Hong Kong Scholarship for Excellence to pursue his postgraduate studies. He will receive HK$250,000 to help him cover tuition fees and other expenses during his year abroad. This new scheme - which drew more than 600 applicants and rewarded 78 elite Hong Kong students "aims to support local students who have excellent academic achievement but lack the financial means to study in top-notch universities outside" indicates the Education Bureau on its webpage. The thinking behind the scholarship is to get back top students with global vision and world-class education to contribute to Hong Kong. Mr. Lai Sze Fat matches perfectly this profile. Indeed, during his Bachelor degree at Baptist University from which he graduated with First Class & Academic Honours, Mr. Lai Sze Fat spent one year in one of the most renowned 'Grandes Ecoles' in France, Sciences Po Paris and he will now complete his Master degree in England. There is no doubt that, with the knowledge and the skills he had and will gain, with the intellectual, intercultural and human qualities he had and will nurture abroad, he will come back as a better citizen and he will be able to achieve his career goal - become a competent urban planner to serve his city - and make a better Hong Kong. We would like here to congratulate again our student and wish him all the best for the future. For more details, please click to read the newspaper article from South China Morning Post and the information of the Scheme in the Educaton Bureau's web page. The outstanding presentation of our student – Megalopolis Construction in the Pearl River Delta (Construction d’une mégalopole du Delta de la Rivière des Perles in French) - was welcomed by Servane GANDAIS, Attaché for Educational & Linguistics Affairs at the French Consulate in HK & Macao and member of the jury in the interview: 'Ken is a student who feels confident and comfortable in French. He is very charismatic, with a presence on stage that made him stand out from other candidates (…) His angle of analysis and presentation was very academic but also very personal. I think he is genuinely interested in urbanism and this is what, I believe, seduced the jury.'. 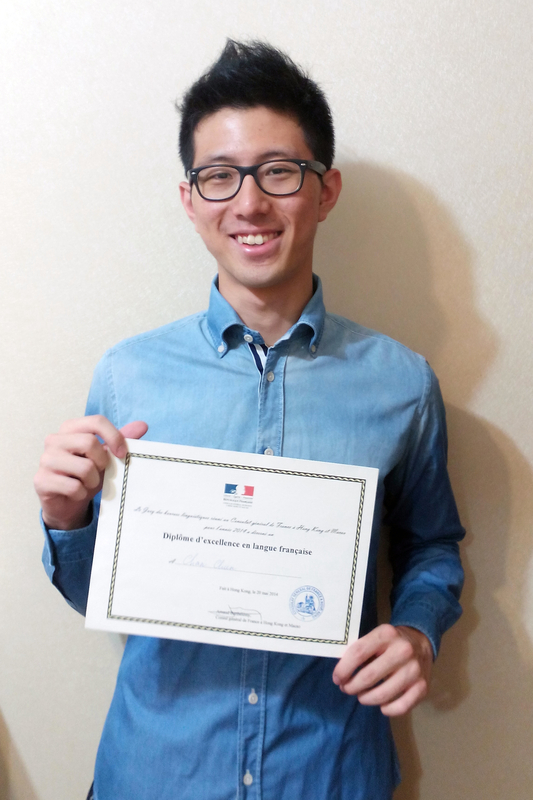 Mr Lai Sze Fat, Ken won a return ticket to Paris, a three-week language course at the University of Lorraine offered by the Consulate General of France in Guangzhou and the University of Lorraine in Nancy. CONGRATULATIONS to our brilliant student! 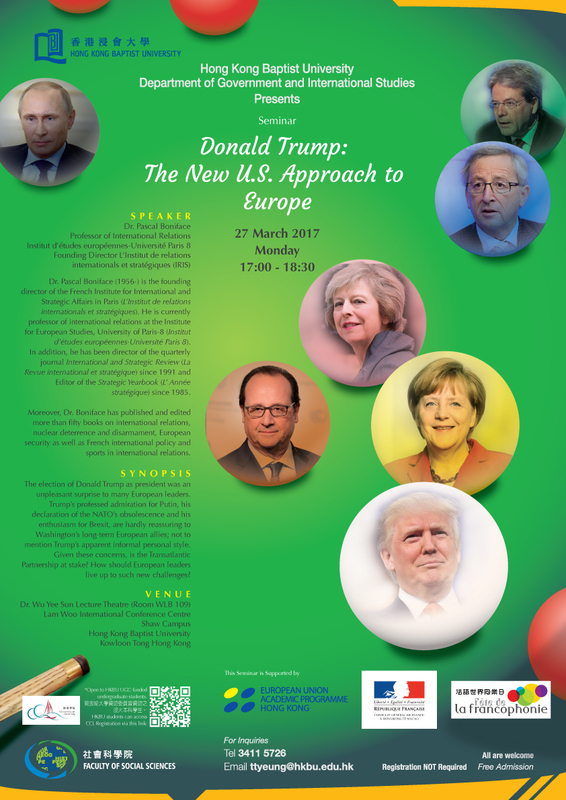 For more details, please go to the website Ambassade de France à Pékin as well as China Radio International's website. Our European Studies / French Stream 2014 graduate: Elaine LAM who, in May 2014, was awarded the prestigious Alexandre Yersin Scholarship to pursue her studies in France - a 2-year Master in Translation (French-English-Chinese) at Paul Valéry - Montpellier University - gives us an insight of her new 'dream' life in the newspaper Mingpao. European Studies / French Stream 2014 graduate: Elaine LAM. 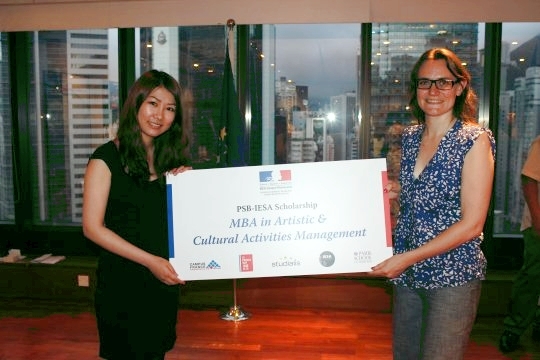 CONGRATULATIONS to our two European Studies / French Stream graduates: Elaine LAM (2014) and Alexandra Wai Chu SETO (2008) were awarded the prestigious Alexandre Yersin Scholarship to pursue their studies in France, at Montpellier University and at EM Strasbourg Business School respectively. They were selected out of 48 applicants. This scholarship is a package including a €660 allowance per month along with social welfare, public liability and repatriation insurance for the preparation of a two year Master degree. The scholarship awarding ceremony, officiated by Ms. Lilas Bernheim, Deputy Consul General of France, took place in the Hong Kong Museum of Medical Sciences, on the occasion of an exhibition celebrating the achievement of Alexandre Yersin - who discovered 120 years ago, the bacillus responsible for centuries of death: The plague. 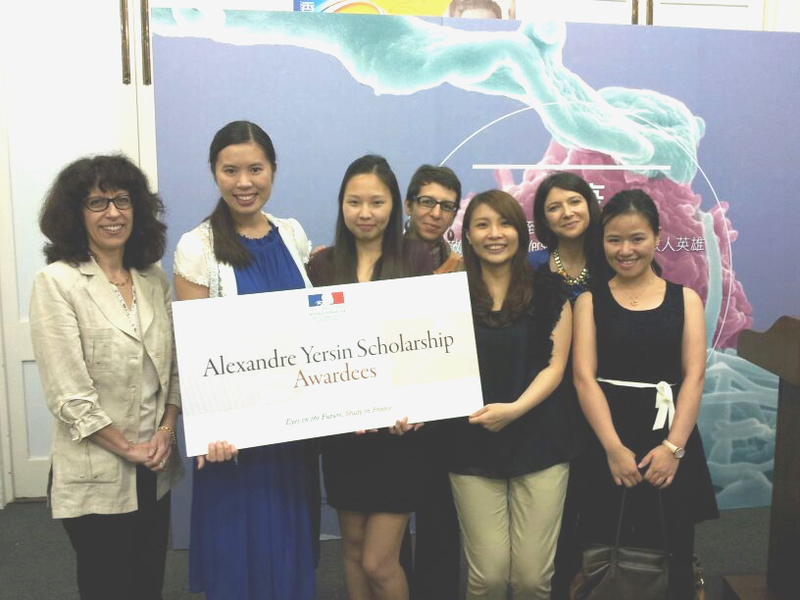 For more details, please read Scholarship Presentation Ceremony 2014 and Results of the selection for the Alexandre Yersin Scholarships Awardees for 2014. 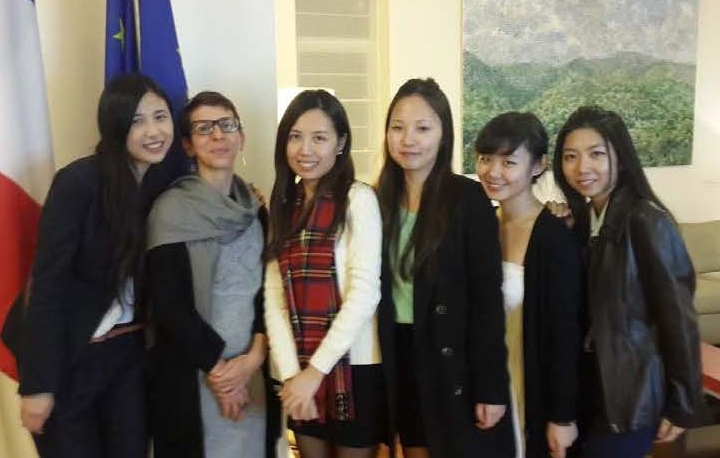 Elaine Lam (2d from the left), 2014 European Studies graduate (French stream) & Alexandra Wai Chu Seto (3rd from the right), 2008 European Studies graduate (French stream) with Ms. Lila Bernheim (2nd from the right), Deputy Consul General of France and their HKBU instructors and friends. Elaine Lam & Lilas Bernheim. 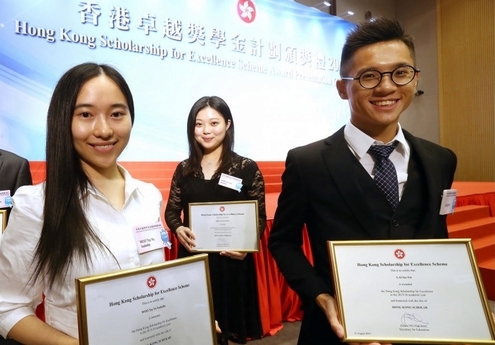 Congratulations also to our two Year II European Studies (French stream) students, Chan Chun Oscar and Hu Jiaqi Amy who received the Excellence Scholarship in French Language jointly run by the Consulate General of France and the Légion d’Honneur Club Hong Kong Chapter. 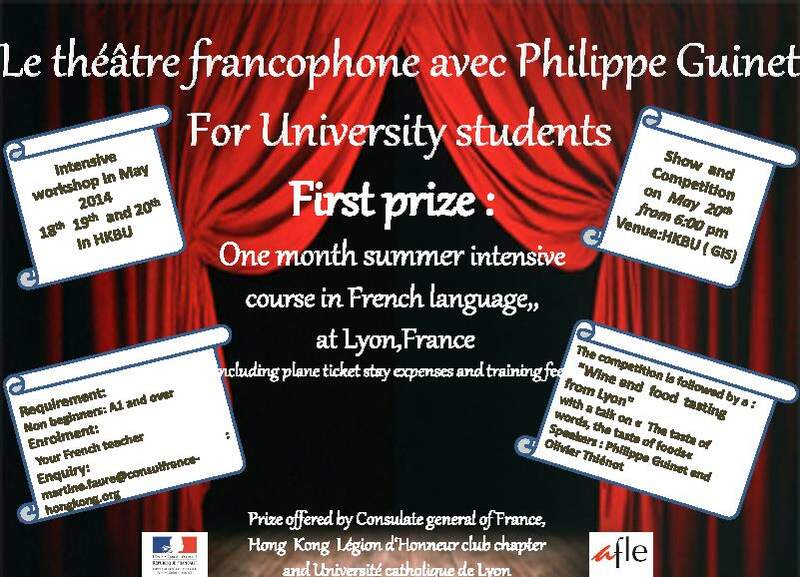 This Scholarship of HK$5,000 rewards applicants with a good proficiency in French language and strong motivation for studying in France. Students were offered a French language course in France at the French Language & Culture Institute of Lyon (ILCF) to be held in August 2014. 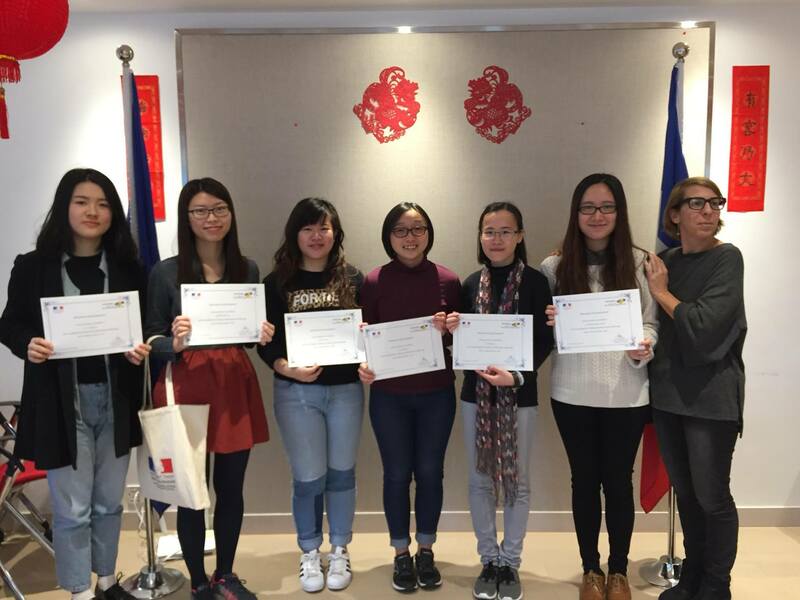 They received a certificate of Diplôme d’excellence from Anne Denis-Blanchardon, Consul for Culture, Education & Science as part of an Inter-University / Francophone theatre event co-organized by the Consulate General of France, the French Teacher Association (AFLE) and HKBU / GIS. 25 students from 4 different universities (Baptist University, Community College of City University, Chinese University and Hong Kong University) joined the intensive training module with Philippe Guinet, creator of the Association Les Passeurs de Mots. This association has been developing workshops and trainings on the orality of the French language for over 15 years, with francophone partner networks such as Services for Cooperation and Cultural Action, Alliances Françaises, French Institutes, UNESCO and/ or Associations of French teachers. A performance and a competition of theatrical expression of the students of the training with Philippe Guinet were organized, followed by a conference-tasting by Oliver Thiénot. At the end of this festive reception Mrs. Martine Faure, Attaché for Educational & Linguistics Affairs of the Consulate of France, officiated the awarding ceremony. 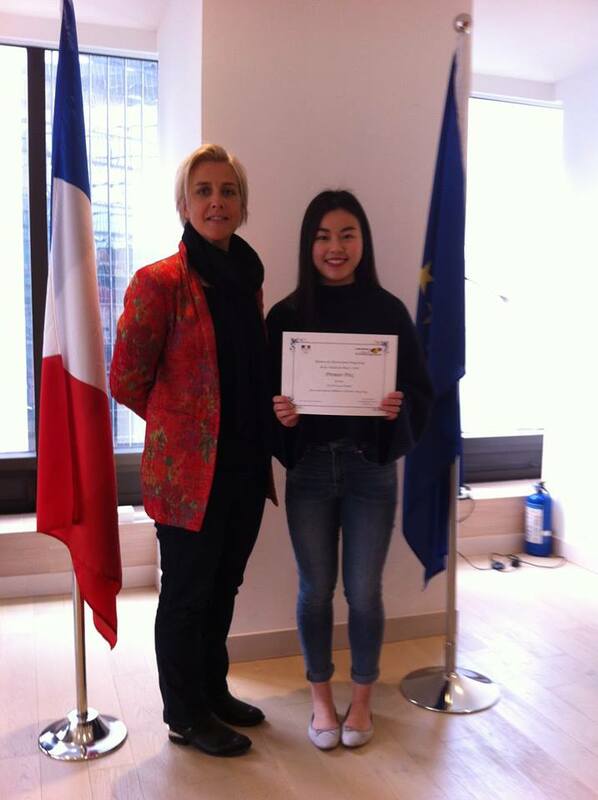 CHEUNG Ka Hei Kei (Year II / European Studies) received the 1st prize, an all-included linguistic stay in Lyon (flight, accommodation, and language course) offered by the Consulate general of France. Congratulations to all our TALENTED French learners!!! 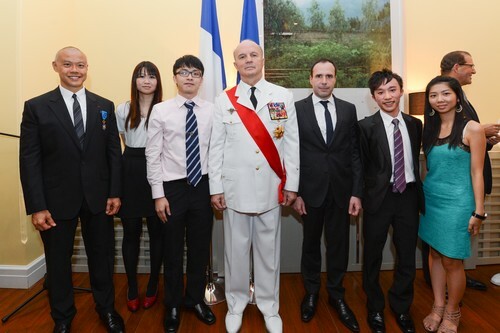 In honour of scholarship recipients of the Joint Programme Hong Kong Legion d’Honneur Chapter Club and the Consulate General of France in Hong Kong and Macau, the Consul General of France in Hong Kong and Macau, Mr. Arnaud Barthélémy, hosted a reception at the French Residence on 25 November 2013 where he invited a hundred laureates who were granted an intensive language course and a chance to discover France for their first time. On behalf of the club of the Légion d’Honneur, Prof. Philippe G. Ciarlet, City University of Hong Kong, warmly congratulated the students. 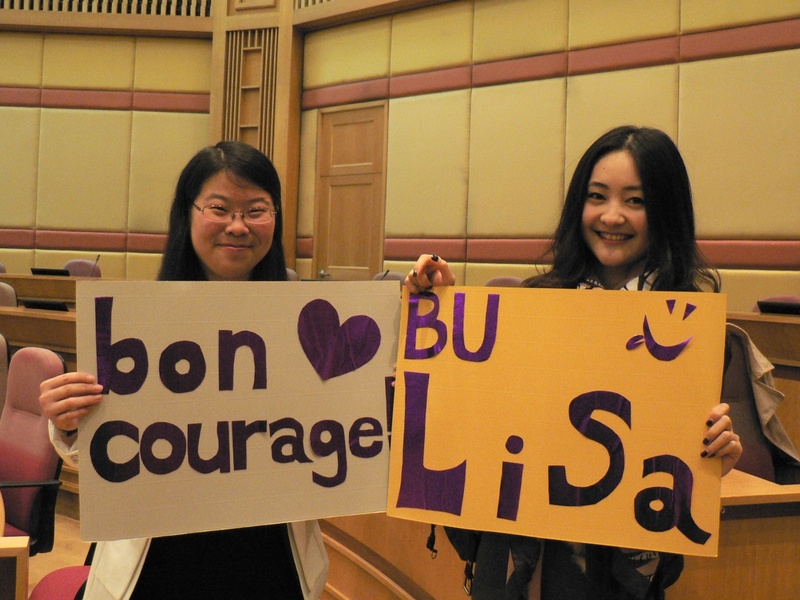 Miss Lavender Cheung (Year 4, European Studies - French Stream), who had attended intensive French language training at Université Catholique at Lyon (France) for one month in 2012, offered a speech of thanks on behalf of HKBU recipients. She shared with the audience her best moment in France and the importance of the scholarship for the students. 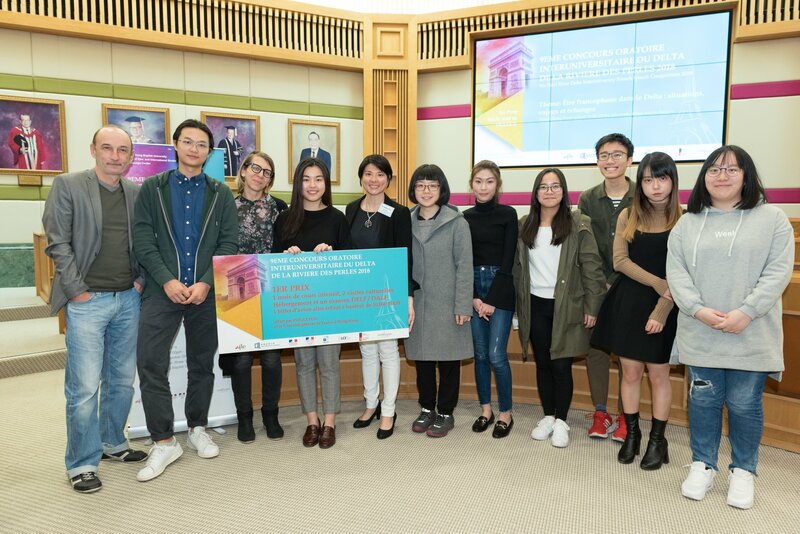 HKBU was also represented by Prof. Adrian J. Bailey, Dean of the Social Sciences Faculty and Ms. Céline Dias, Lecturer II, Department of Government & International Studies. 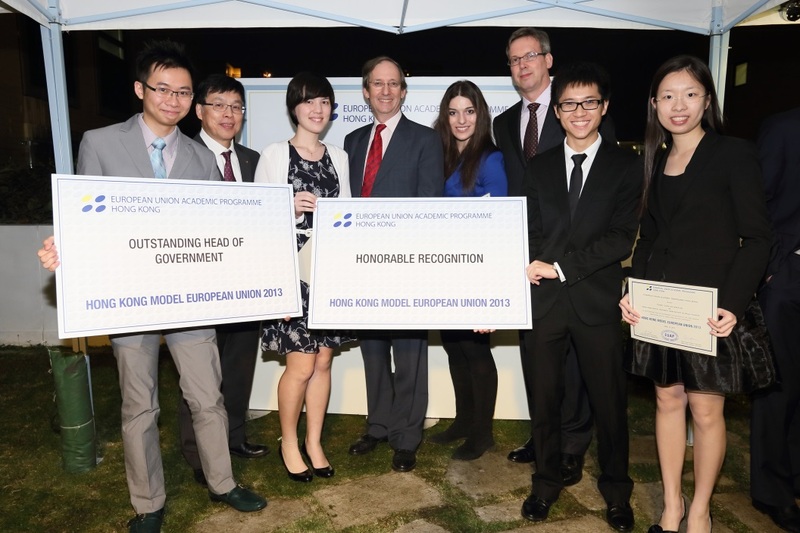 In 2012, the following 13 European Studies (French Stream) students were awarded scholarships of $5,000 to help them to start their third year study in France: CHAN Pui Shan, CHAU Wing King, CHEN Yongtong, CHENG Chi Ming, CHEUNG Yui Ming Lavender, CHONG Man Yi, HUI Cho Yan, LAM Elaine, LEUNG Yeuk Yin, MOK Siu Wai, TAM Ka Yee Agnes, WONG Siu Wai, and ZHANG Zitian. 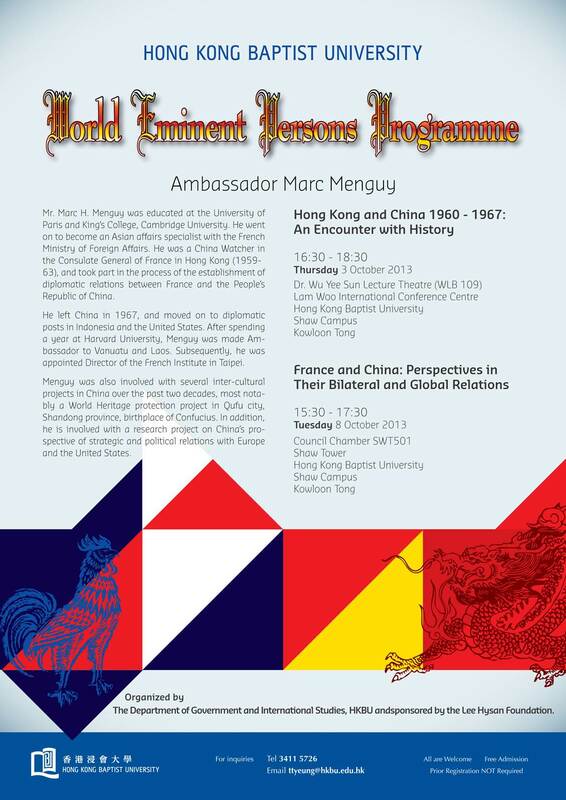 Ambassador Menguy delivered two lectures (October 3 and 8, 2013) under the auspices of the World Eminent Persons Programme, financed by the Lee Hysan Foundation. The Programme was initiated in 2008, aiming to invite prominent personalities in different sectors from all over the world to give intellectually inspiring talks to all members within our university community, so as to broaden their horizon, enrich their knowledge on international affairs, promote better understanding of the outside world, and stimulate their thinking. Ambassador Menguy was posted in Hong Kong from 1959 to 1963, and took part in the process of the establishment of diplomatic relations between France and the People's Republic of China in 1964. Then he worked in the French Embassy in Beijing until 1967, and experienced the tumultuous Cultural Revolution. He was later posted in Indonesia and USA, opened the French Embassy in Hanoi in 1976, and became French Ambassador in Laos. 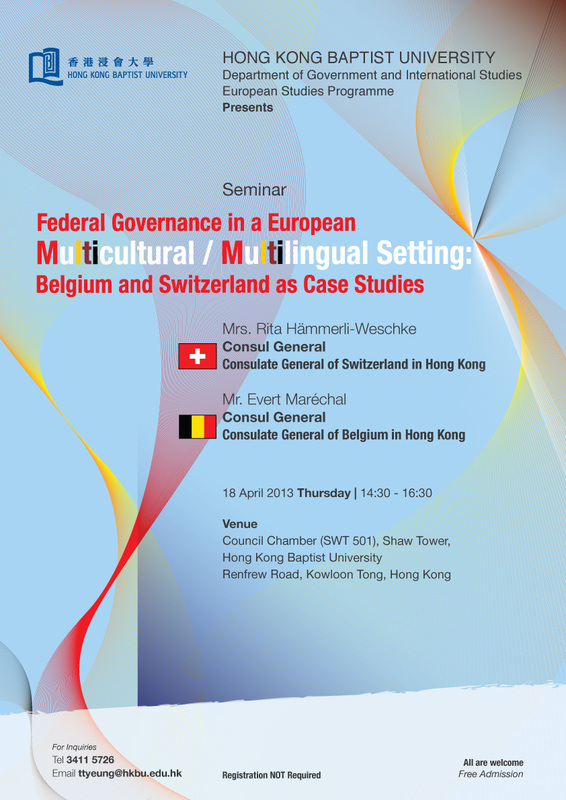 Subsequently, he was appointed as Director of the French Institute in Taipei. So he had the chance to be posted in all the three major cities in Greater China: Hong Kong, Beijing and Taipei. Ambassador Menguy's lectures was definitely very helpful to students who wish to have a deeper understanding of Sino-French relations yesterday and today. The CEFC is a publicly funded research institute, part of the network of the 27 French research centres abroad supported by the French Ministry of Foreign Affairs and the CNRS (the French National Centre for Scientific Research, Centre National de la Recherche Scientifique). 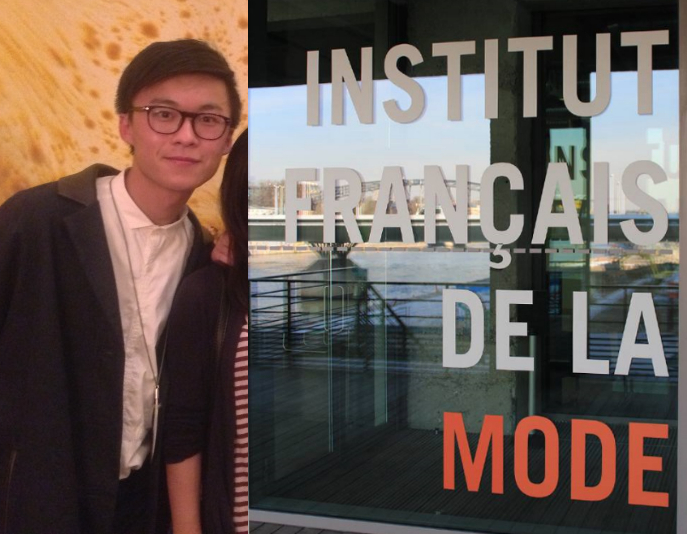 Reichen Mak Cheuk Nam, a 2013 European Studies / French stream graduate, received a scholarship to enroll in a postgraduate program in management fashion, design and luxury at the Institut Français de la Mode (Paris) in September 2013. Visits to European institutions including the European Commission and the European Parliament. Discussions with EU officials or experts in person about different issues such as Human Rights, Green Energy Policies, European Integration, Hong Kong-EU relation, etc. A dialogue session with representatives of the Hong Kong Economic and Trade Office in Brussels. 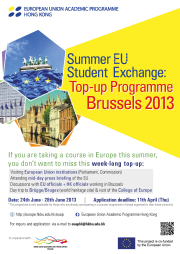 A day trip to Brugge, a wonderful medieval city and world heritage, and visiting College of Europe. 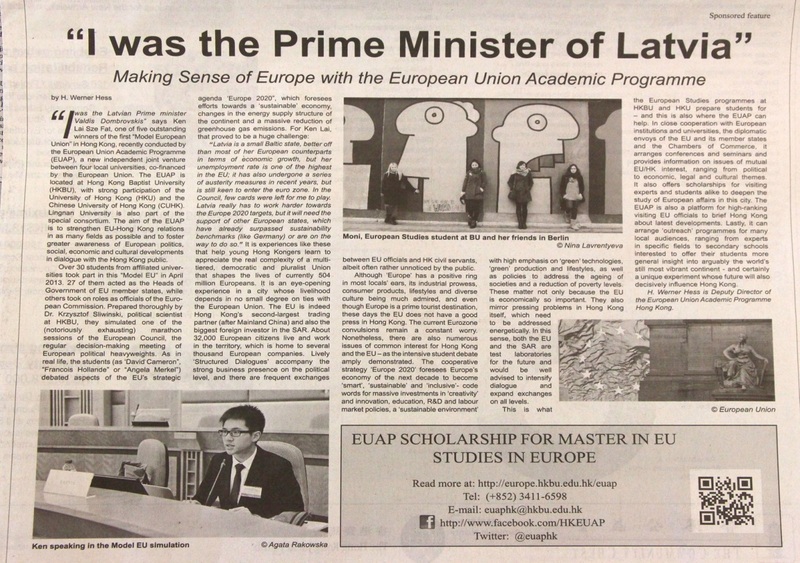 On the 2d of May 2013 took place the opening reception of the EUAP, European Union Academic Program., on the the 5th floor of David C. Lam building where their office is located. 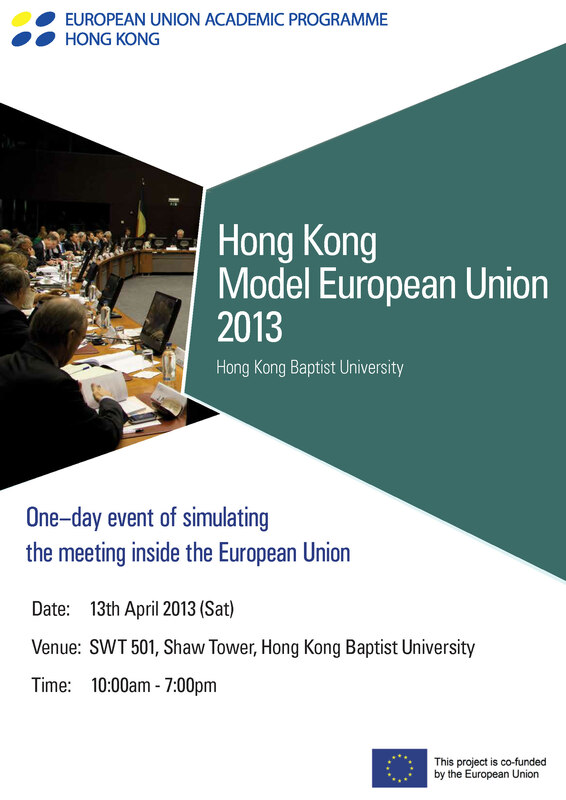 EUAP is a consortium of 4 universities (HKBU, HKU, Chinese and Lingnan U) aiming to strengthen the relations between EU and HK through academic events such as the Model European Union where two YEAR II students of European studies / French stream, Bridget Clancey and Ken Lai Sze Fat, earned honorable recognitions for their roles as Austrian Chancellor Werner Faymann and Latvia's Prime Minister Valdis Dombrovskis, respectively. Bridget Clancey and Ken Lai Sze Fat with Prof. Jean Pierre Cabestan, Director-General of EUAP HK, Prof. Rick Wong (vice-President) and Mr. Vincent Piket, Head of the EU office to HK and Macao, along with the three other outstanding students. During 8 weeks, Year I students were involved in a e-project with a student in Master of Linguistics in La Reunion University, Mrs. Sylvie Mussard, with the aim of enhancing and strengthening their linguistic and intercultural skills in French. 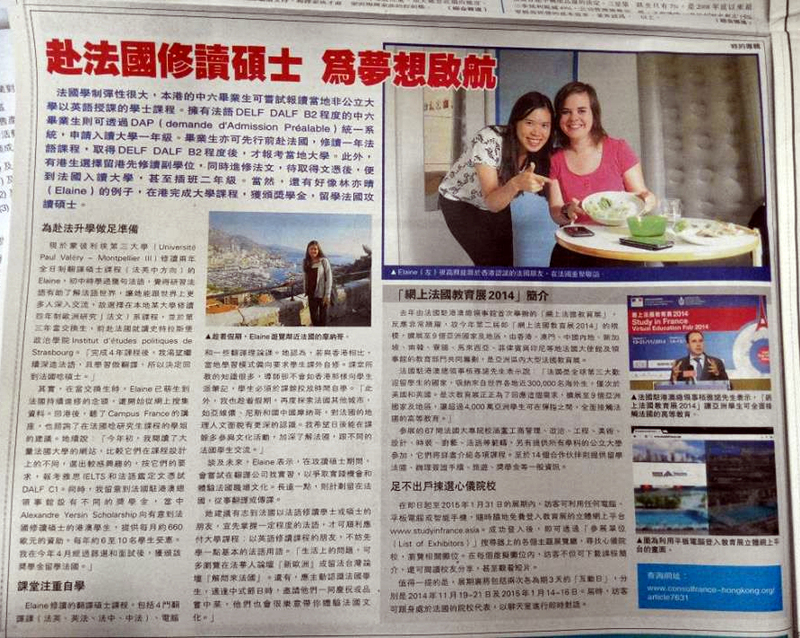 The project titled "Discover La Reunion / Discover HK" resulted in a video produced by the students introducing their city. Click here for more details of the scholarship. European Studies Programme graduate (French stream), Miss Siyi CHEN. 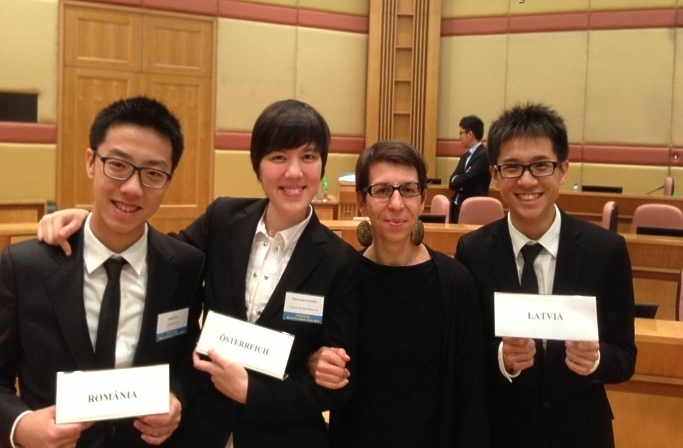 Three European Studies (French stream) students, Christopher IP Long Chak (Year I), Bridget Clancey and Ken Lai Sze Fat (Year II) participated in a simulation of a European Council meeting concerning 'sustainable' growth and energy policies in the EU until the year 2020. 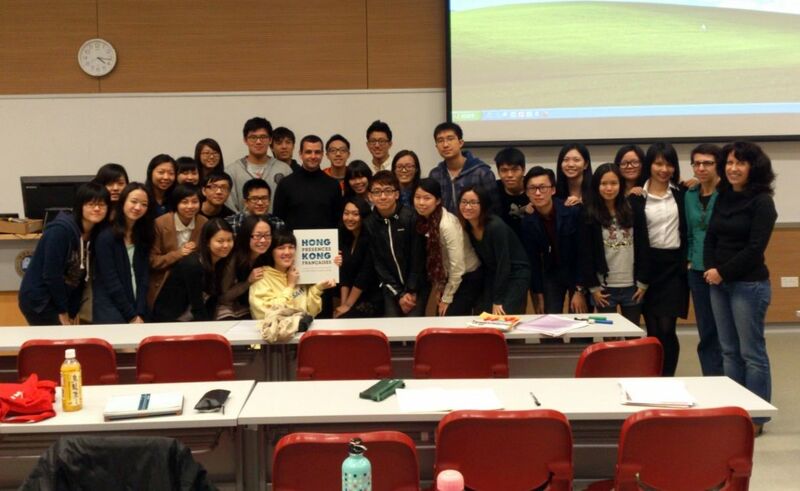 HKMEU Coordinator, Dr. Krzysztof Sliwinski had organized 5 training workshops across March and April to prepare the students from the four universities involved in the EUAP (HKBU, HKU, Chinese and Lingnan U) to this day-long simulation. 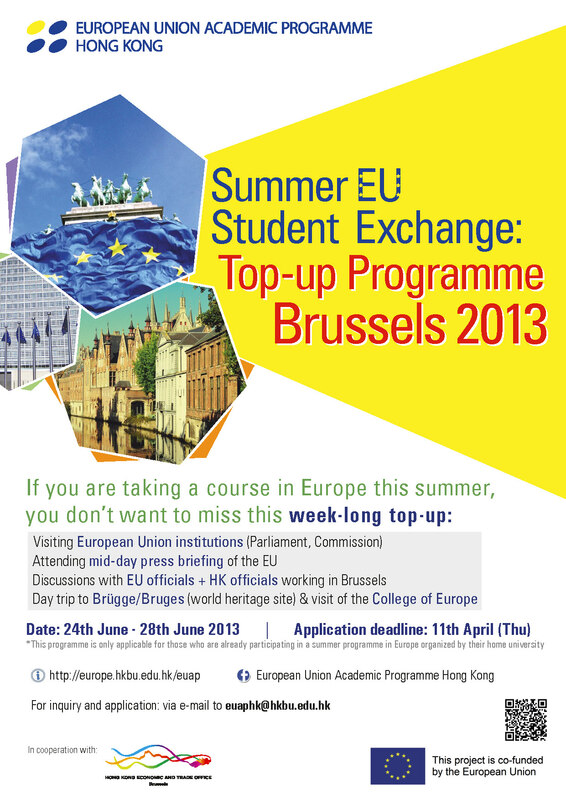 3 European Studies (French stream) students: Christopher IP Long Chak (Year I), Bridget Clancey and Ken Lai Sze Fat (Year II). SCMP: 'I was the Prime Minister of Latvia'. 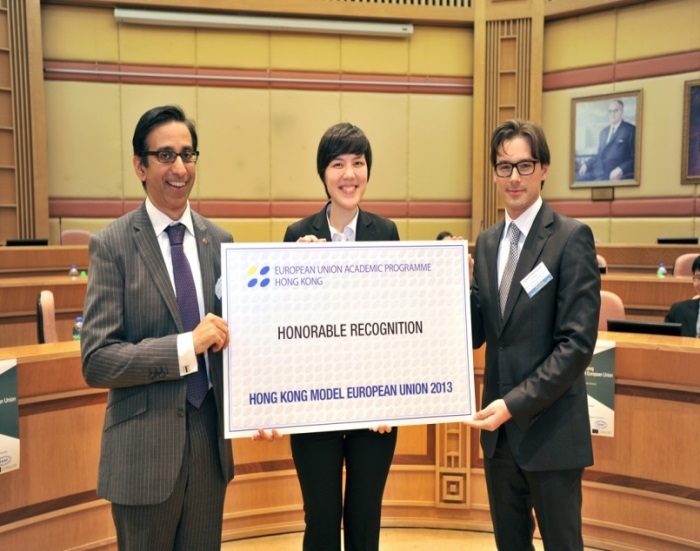 Dr. Krzysztof Sliwinski, Bridget Clancey and Mr. Asad Beg (First Counsellor and Head of Press & Information Section, EU Office to Hong Kong and Macau). 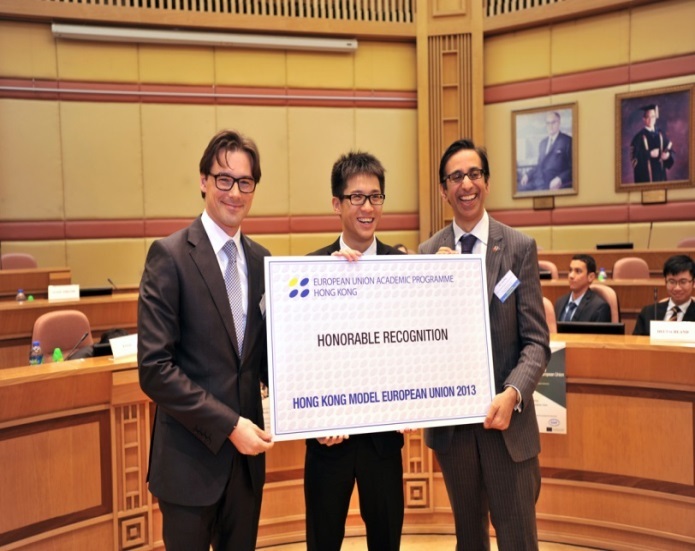 Mr. Asad Beg (First Counsellor and Head of Press & Information Section, EU Office to Hong Kong and Macau). Bridget Clancey and Ken Lai Sze Fat earned honorable recognitions for their roles as Austrian Chancellor Werner Faymann and Latvia's Prime Minister Valdis Dombrovskis, respectively. 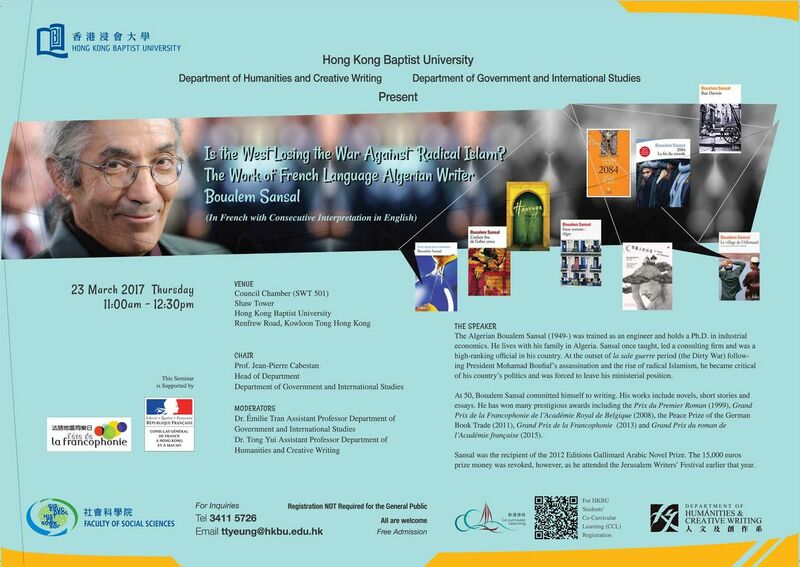 François Drémeaux est professeur d’histoire au lycée français Victor Segalen de Hong Kong et fut la cheville ouvrière de la rédaction du livre « Hong Kong, Présences Françaises », au cœur d’un comité de rédaction ayant regroupé durant plusieurs années experts et familiers français de Hong Kong. 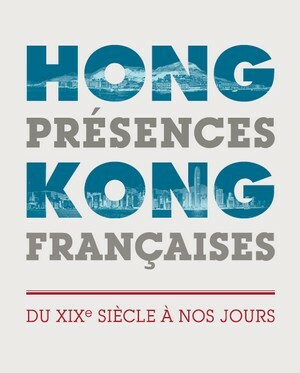 Son livre, réalisé avec le soutien du Consulat général de France à Hong Kong et Macao, retrace avant tout «ces petites histoires de Français, anonymes ou illustres, [qui] permettent de bien comprendre ce qu’est la présence française à Hong Kong ». 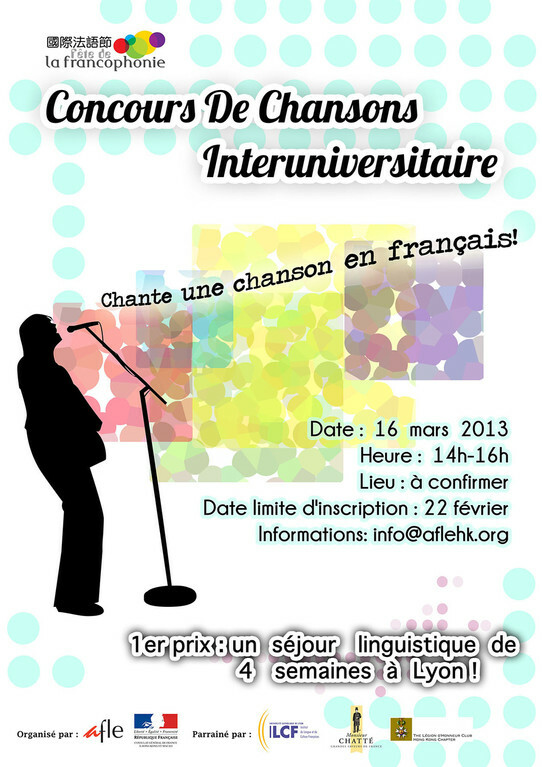 3 European studies / French stream students, KU Shuk Ting Aurore (Year II), MA Kai Ho, Loïc and HE Lanshan (Year I) participated in the 3rd edition of French songs contest on March 16, 2013. M. MA Kai Ho, Loïc won the audience prize with the song "Les Champs-Elysées" and M. HE Lanshan, the 2d prize with "L'Horloge tourne".For more details and photos, click here. Lanshan and Loïc (middle) with the pianistTerry Truck (left) and the singer Mouron (right). In honor of scholarship recipients of the Joint programme Hong Kong Legion d'Honneur Chapter Club and the Consulate General of France in Hong Kong and Macau, the Consul General of France in Hong Kong and Macau hosted a reception at the French Residence on December 17, 2012 where Mr Reichen MAK Cheuk Nam (Year IV European Studies / French stream student) gave a speech of thanks on behalf of his classmates and shared his best moment in France with the audience. Mr Reichen MAK Cheuk Nam with Arnaud Barthélémy, Consul General. Lavender Cheung (on the right) from European Studies, Dept. 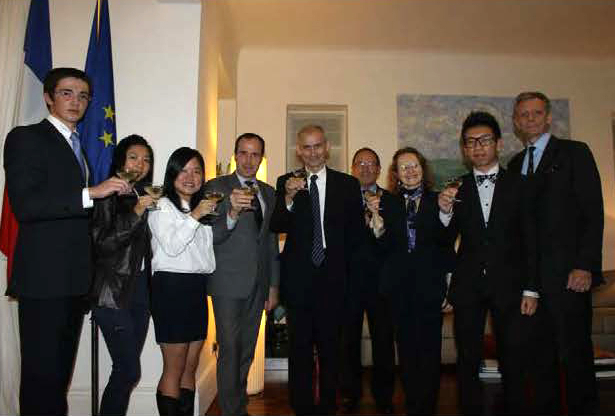 of GIS, HKBU in compagny of 3 other students of Hong kong universities participated at the cocktail reception which was organized at the French Residence Here with General Georgelin, Grand Chancellor of the Legion of Honour, Chancellor of the National Order of Merit and Army General and Mr Arnaud Barthèlemy, Consul General of France in Hong Kong and Macau. 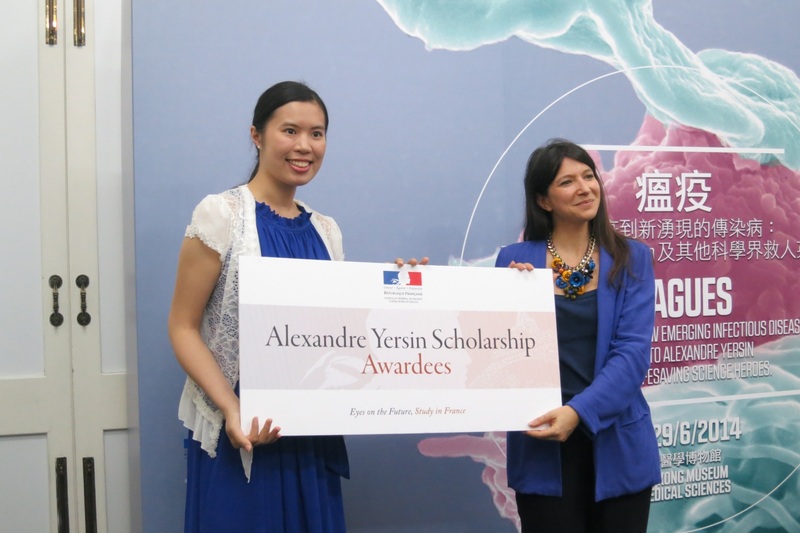 A former graduate of the French stream, Ms Yuk-Mei CHAN, is one of the recipients of the Alexander Yersin scholarship offered by the French Consulate General in order to prepare a Master degree in France. She has been admitted in the Master Programme in International Wine Trade at the University of Avignon. Miss Clancey Bridget Meave To (Year1, European Studies - French Stream) won the 1st prize at the 7th Short Story Writing Competition organised by the Language Centre, HKBU on 23 April 2012. To read Clancey Bridget Meave To's story, please click here. 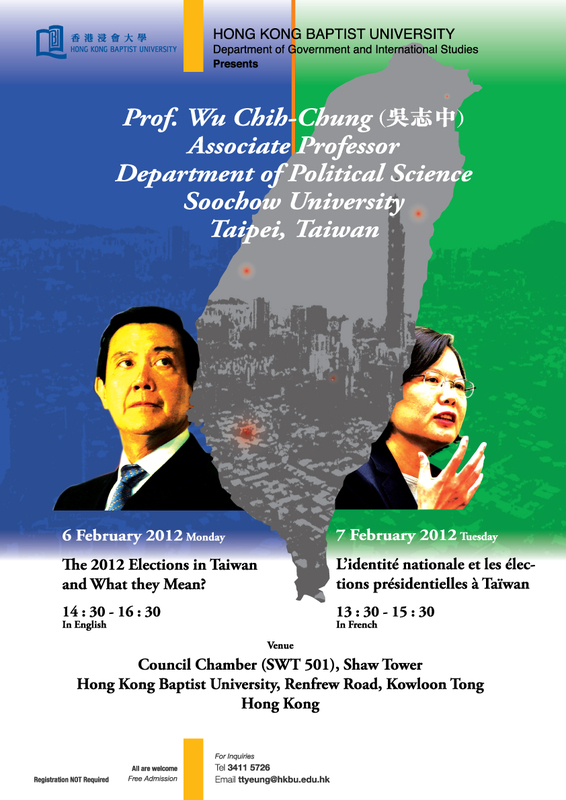 Departmental Seminar - The 2012 Elections in Taiwan and What they Mean? 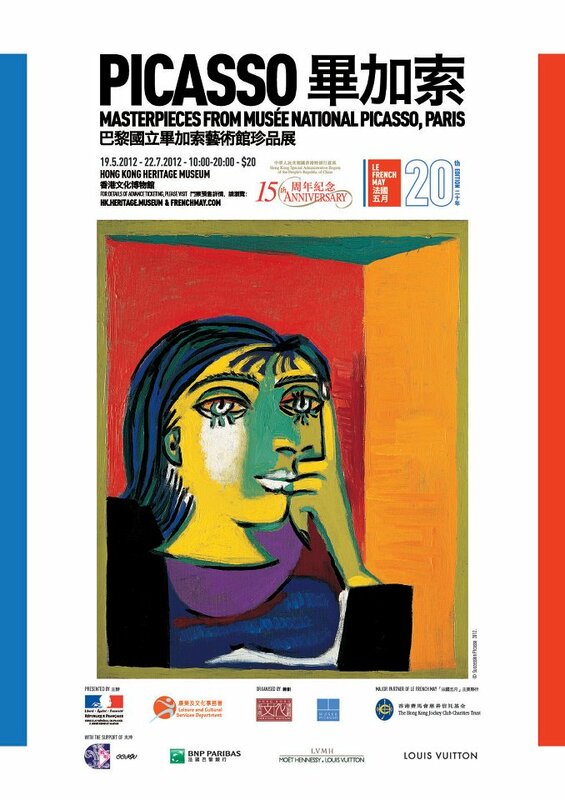 Prof Wu, from the Department of Political Sciences of Soochow University in Taipei, held two conferences, one in French, on the presidential elections in Taiwan. 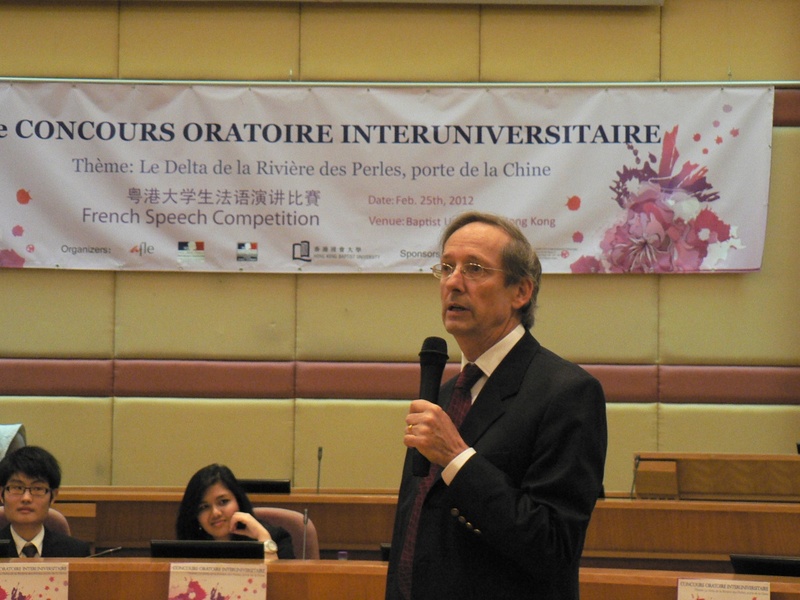 On 25 February 2012, the Hong Kong Baptist University hosted the 3rd edition of the "Concours oratoire interuniversitaire du Delta de la Rivière des Perles" (The Pearl River Delta Interuniversity French Speech Competition) which is a prestigious event jointly organized by the Association of Teachers of French in Hong Kong and Macau (AFLE), the Consulate General of France in Hong Kong and Macau and the Consulate General of France in Guangzhou. 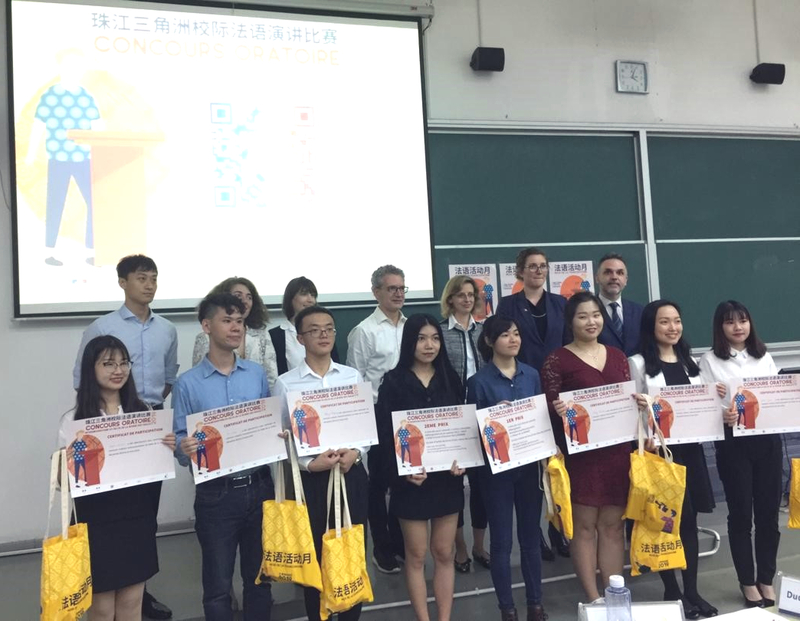 This competition brings together candidates from the best universities in the Pearl River Delta region who are required to deliver a 10-minute presentation in French on a given theme in front of a jury composed of French-speaking VIPs and specialists of this type of exercise. Prof. Jean-Pierre Cabestan, Head of GIS Departement at Baptist University. 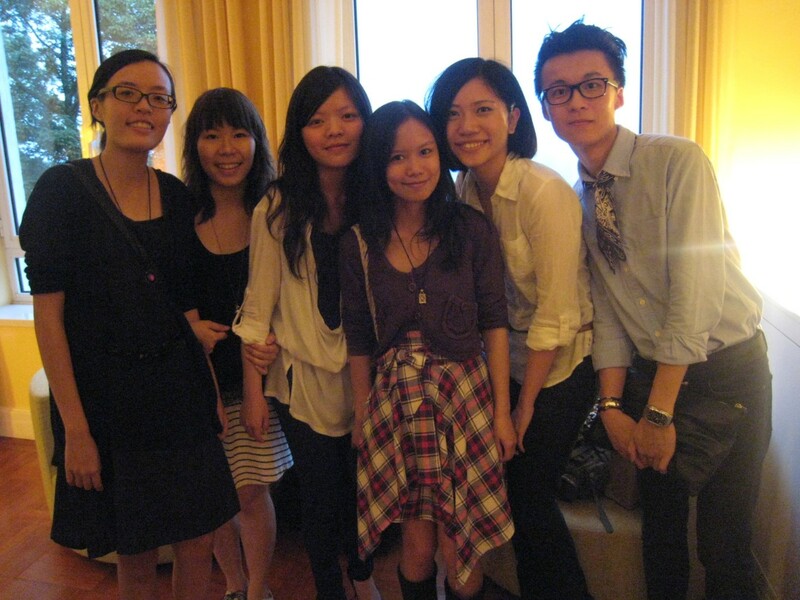 The candidate of the European Studies program of the GIS department was Miss Lisa Zhuoyue LI (on the left), Year IV. Prof. Jean-Pierre Cabestan, Head of GIS Departement at Baptist University opened the ceremony and stressed that the Concours oratoire had been a successfully endeavour over the years. This year, 13 candidates, coming from 12 different universities, - 5 from Hong Kong, 5 from Guangdong, 1 from Shenzhen et 1 from Guangxi -, were in competition. The candidate of the European Studies program of the GIS department was Miss Lisa Zhuoyue LI (on the left), Year IV, did a remarkable presentation on the 2012 theme : "The Delta, gateway to China". Master of Ceremony LAI Sze Fat, Year I, European Studies. Thank to our great Master of Ceremony from Year I, LAI Sze Fat, the event was a success. 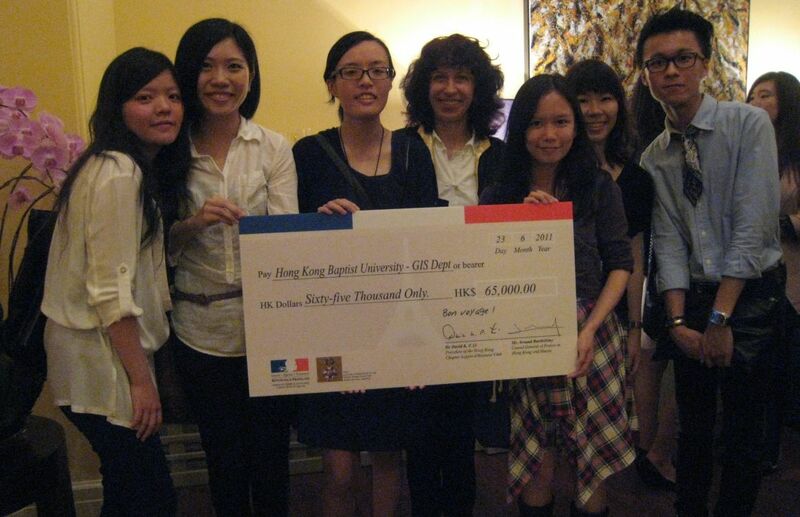 Once again, this 3rd edition of the Concours oratoire, this year organised by the GIS department of the Baptist Uinversity, showcased the high quality of French language programs offered by universities in the Pearl River Delta region and also gave public recognition to the achievements of the teaching staff and the students. 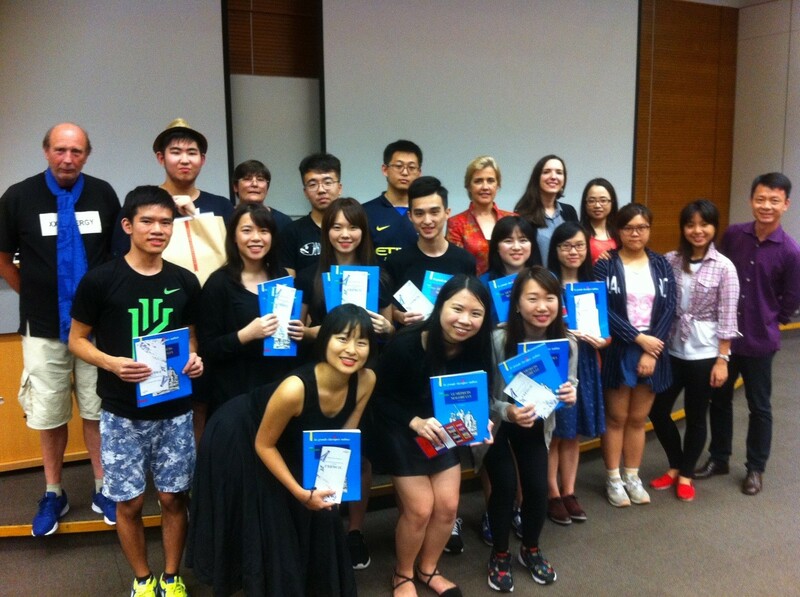 This event confirmed that French is, well and truly, becoming the fourth language in Hong Kong! For more details, please click here and here. 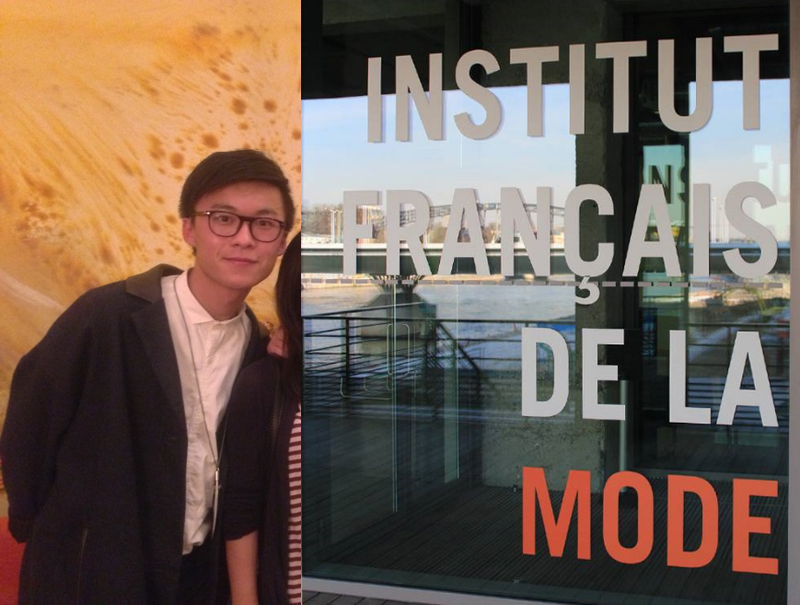 Jiayi WEI (Year IV student, European Studies Programme, French stream) obtained the France Excellence scholarship (French Embassy, Beijing) and will enroll in the Master programme of European studies at Paris 3 la Sorbonne Nouvelle (FRANCE). Reichen Mak, Year II (2010-11). As previous years, our Year II students have been offered a scholarship by the Consulate General of France and the Chapitre de Hong Kong du Club de la Légion d'Honneur. They will attend intensive French language training at Université catholique at Lyon (France) for one month. The scholarship ceremony took place at the residence of the Consul general of France on June 23. Hong Kong Baptist University was represented by Prof. Franklin LUK, Vice-President (Academic), Prof. Adrian Bailey, Dean (Social Sciences), Mr. Peter Li, Director (International Office) and Dr. Béatrice Cabau (Course coordinator, European Studies Programme, French stream). For more details, please click here or here. 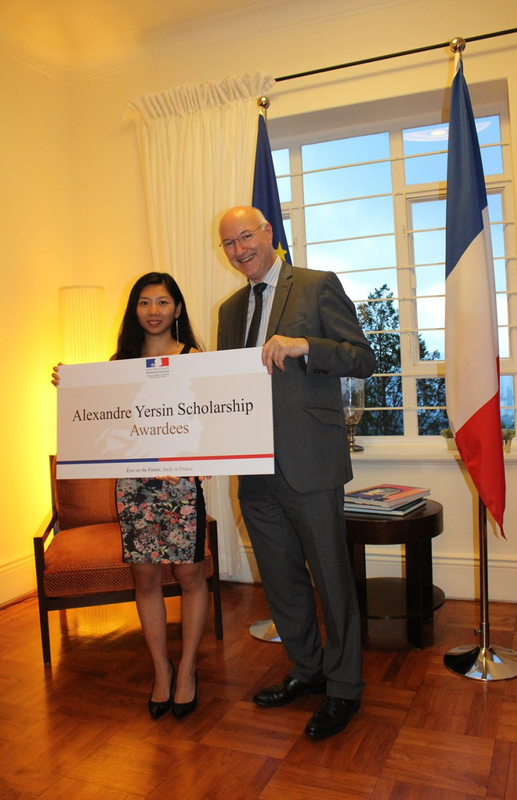 Ms. Cherry CHAN (Year IV student) was granted the "Alexander Yersin" Excellence Scholarship 2011 (Consulate General of France, Hong Kong). The scholarship includes an allowance of €909 per month (around 10,000 HKD), social welfare, public liability and repatriation insurance, and accommodation help ("EGIDE" offers services to help students to find accommodation) and social as well cultural activities guide. 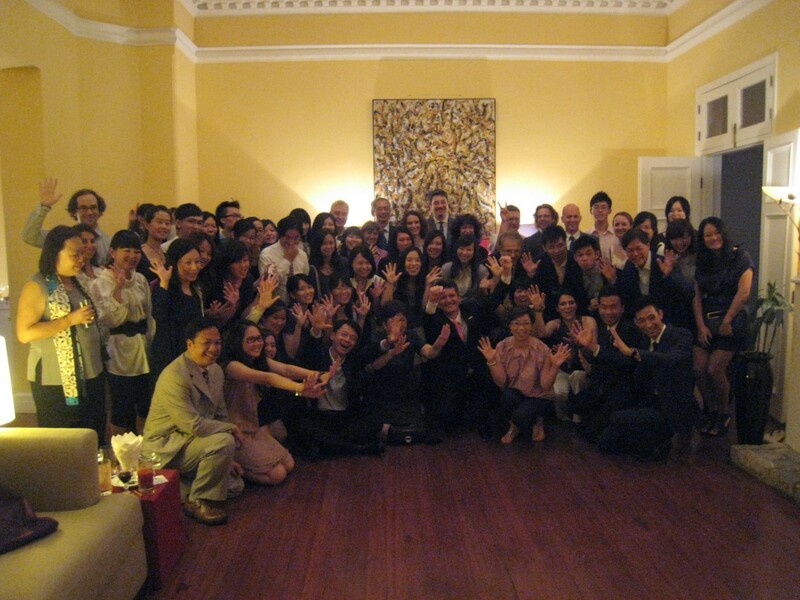 Le 2 décembre 2010, un cocktail a célébré le partenariat du Consulat Général de France et du Chapitre de Hong Kong du Club de la Légion d'Honneur, lequel permet chaque année à des étudiants hongkongais de suivre pendant l'été un cours intensif de langue française dans l'un des centres de FLE (français langue étrangère) ayant reçu le label QualitéFLE. Les professeurs de français des universités partenaires à Hong Kong – dont Mme Béatrice Cabau, maître de conférences et coordinatrice de la section de français du Programme d'Etudes européennes de la Hong Kong Baptist University, ont reçu des mains de Sir Wayne Leung, vice-président et trésorier du Chapitre de Hong Kong du Club de la Légion d'Honneur, des chèques lors de la cérémonie qui a suivi les discours officiels.